Sewing could be intimidating, especially if you’ve never handled a sewing machine or even a small project by hand before. But the fruits of learning how to sew are incredible. It’s empowering, the ability to alter your clothes so they could fit you so well, or the capacity to make your own sheets, pillow covers, and other home projects with the patterns that you like. This is both a warning and an encouragement. You will meet many humbs and bumps along the way, but tell you what, you’ll get over it. It always come in handy when you know about them beforehand. Get on with your sewing journey all prepared for what’s to come. This is the most common mistake that a new sewer would make. Unlike recent gadgets, a sewing machine could be easy to use, but the word “easy” is relative. It takes patience to learn sewing and be adapted to it. Along the way, you could get too excited and make idealistic mistakes, like overestimating the your own capacity, or that of your machine. Be practical and realistic. Start with simple projects and realistic deadlines, and go up the ladder slowly but surely. Fabrics are not created equal. Each has its own texture, durability, and feel. Some are more sensitive than others. Some are smooth, others are rough. They are used optimally for different purposes and with different kinds of needles, threads, and handling procedures. Some fabrics are also too thick or too delicate for some sewing machines. Some fabrics shrink after being washed, some are stretched. Fabrics change form when washed and it could be frustrating when you think you’ve actually made the perfect fit or form, only to have it ruined by washing. Use high-grade thread for your projects. Some will easily break. But worse, some may be inappropriate for your needle or fabric. Ball point needles, for example, are used for knitting. Universal needles on the other hand fit best to natural fiber threads. Other special projects like leather require special needles and threads. Different needles for different projects. Each has its own purpose, this is why there are so many options to choose from. No each and change as needed to keep them for a long time! You wouldn’t want your needle to hit the pins. That could do some damage to the sewing machine, needle, or the project itself. None of these are okay. Know your sewing machine well. It’s features, parts, and specialty. Each is designed for a specific purpose. Some budget machines are best for simple projects. Some features are best for quilting and other projects. It pays to know all its features, stitches, and mechanism. This way, you get the most out of it. These accessories are not simply freebies or the perks of having a new sewing machine. They have their functions. Nothing about sewing is universal, each project, fabric, and needle has a special function. Sewing machines come with 4 basic presser foot that are used for different purposes. It also comes with oil for lubricating the machine, and so many other accessories. 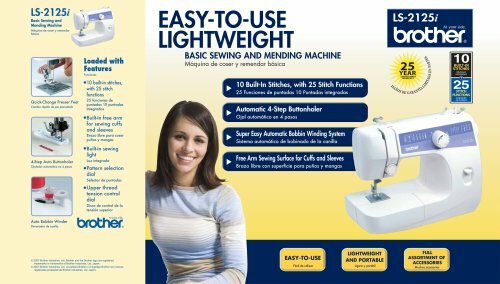 Knowing each and putting them to use will not only make your projects smooth-sailing, it will also prolong your sewing machine’s life. If you think your fabric moves too much, it’s because you think you can hold it freestyle and just go stitching. Nope, the presser foot has to be lowered and its purpose is to hold the fabric in place. Neglect testing before proceeding with a project. Always leave an allowance for mistakes and anticipate it. No matter how good you could be, always test the stitch size, width, and the sizes out first before you proceed with creating your final touches. Always be ready to test your ideas out first because our imagination has the tendency to be too idealistic. That’s it! A new sewer could make more mistakes than these, but don’t let it get to you. See experts or be involved with fellow starters and some experts and be guided well in your sewing endeavors! Sewing could be quite scary for beginners. It makes use of needles and is used for some serious fashion and home improvement projects. It could be intimidating for most, but all it takes is taking it slowly step by step, just like how we learned each concept and skill from school since we were young. Being an expert in sewing requires eagerness to learn and confidence. Here are some tips to overcome the beginners’ stage and be a pro with your sewing skills! Sewing is a wide field and there’s a lot to explore. It would help if you have priority projects in mind to narrow down your beginner’s steps with the goal of mastering skills that you will need to prepare yourself say, for quilting or dress-making. Would you like to be artistic? Would you want to learn more complicated stitches eventually? What are the capacities and limitations of your sewing machine? Is it digital, and how many stitches is it equipped with? Will it be able to handle all types of cloth or do you need to stick with thin fabric? There are different kinds of sewing machines and each has its capacities and limitations. You don’t need to let that stop you, but you would need to know these to know which stitches you need to learn by hand, and which stitches could you do with your sewing machine. You could explore any project, and it would be good if your sewing machine could do most of the work, but you could learn some stitches by hand too. Take at least 30mins-2hours every day to practice with your sewing machine. Feel how fast or slow you need the machine going, and how fast you should step on the pedal without panicking with the piece of cloth in your hands. Know the controls and pre-sets well, and as you practice, always take a small piece of scrap cloth for testing before you proceed with continuous stitching in a project. Most sewing machines allow adjusting the width and distance of stitches, you can also try tweaking these until you come up with your desired setting, again, with a piece of scrap cloth. Know how to change needles, bobbins, and how to oil and maintain your sewing machine too. If you really want to get past the beginner stage, you need to keep your sewing machine intact and well-functioning, because we can’t let a dysfunctional sewing machine get in the way of smooth learning. Set goals for yourself and setup projects that you want to finish. Have it weekly or monthly, this will help you proceed progressively in your learning process. Don’t let anything disappoint you. As said, always have a scrap cloth ready for practice, especially if you want to try on a new stitch. That’s about it! To keep things simple, practice regularly and make sure that you are familiar with your sewing machine. Have goals and try projects. Try more difficult ones overtime and watch yourself become better and better. Good seamstresses are not born, they are made.